Home > Uncategorized > We Owe It All to You, Tucson! Each year, an intrepid team at the Tucson Weekly embarks on a mission to get Tucsonans to show some love for their city. How do Tucsonans display their affections? They cast their votes for Best of Tucson® awards! 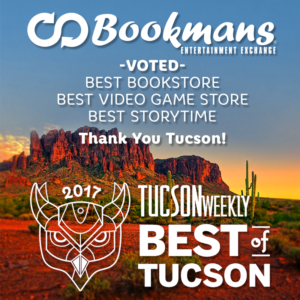 It is with so much excitement and true gratitude that Bookmans announces that we were voted Best in three different categories for Best of Tucson® 2017! And we owe it all to you, Tucson! 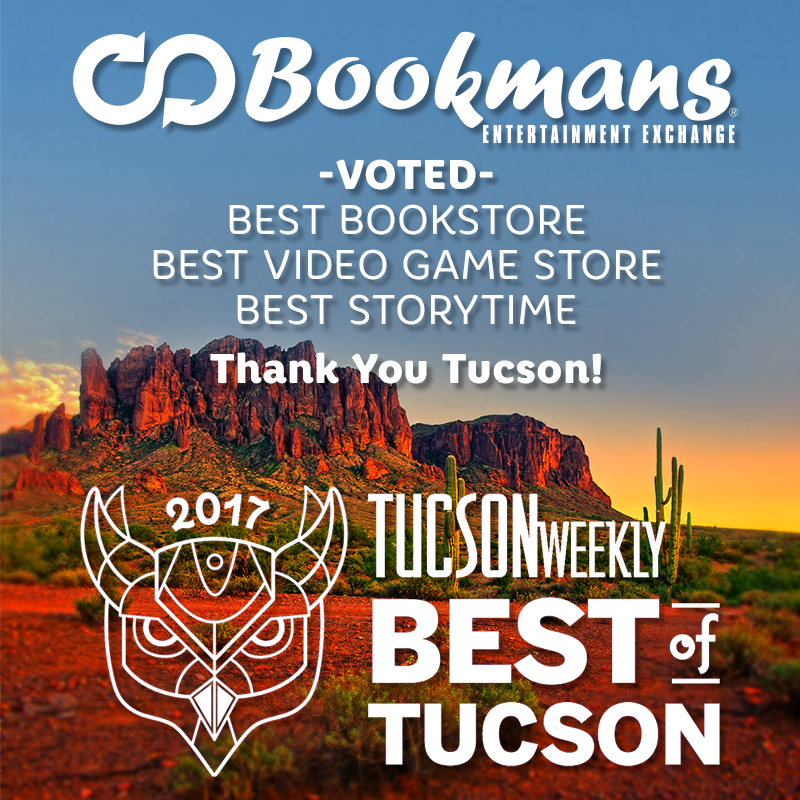 Bookmans won your vote for Best Bookstore, Best Storytime, and Best Video Game Store in Tucson! The Best of Tucson® awards are not a popularity contest. They are a time-honored tradition dating back nearly 20 years. BoT gives Tucsonans the opportunity to voice their opinions and show some love for their favorite local businesses. Bookmans is proud to be an enduring member of the Tucson landscape for more than 40 years, and prouder still to stand alongside other outstanding local businesses, personalities, and attractions who make life in Tucson so amazing! The Best of Tucson® 2017 awards were all about creature comforts, those places that locals and visitors alike are drawn to most. With three locations in Tucson and three additional locations in Arizona, Bookmans has always had one goal in mind – to be a cool place to hang out and the serve public’s needs and interests. For us, serving the public means sticking to our core values. Those values include childhood literacy programs like Kids Club and 1317, supporting the efforts of local animal rescue organizations, spreading environmental awareness and sticking to a recycling-based business model, and fighting for free speech and against censorship. It is our extraordinary privilege to be a part of the Tucson community! Thank you to everyone who voted, everyone who shops with us, and everyone who makes Tucson such an awesome city to live, work, and play!